Special Olympics is a global movement that unleashes the human spirit through the transformative power and joy of sports, every day around the world. Through sports, health, education and community programming, Special Olympics is tackling inactivity, intolerance, isolation and injustice that people throughout the world face, especially people with intellectual disabilities. 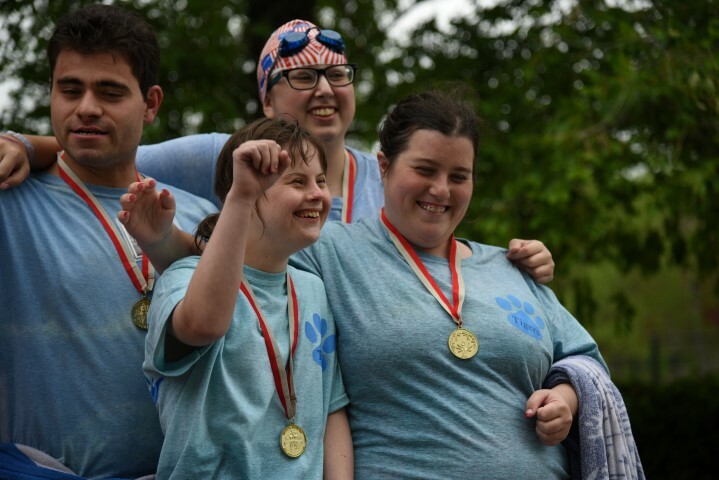 Special Olympics Rhode Island is one of the state’s most dynamic programs, providing over 1,600 year-round sports training and athletic competition opportunities to more than 4,000 children and adults with intellectual disabilities. Special Olympics Rhode Island hosts over 40 statewide tournaments and competitions each year in 20 official and demonstration sports. The mission of Special Olympics Rhode Island is to provide year-round sports training and competition in a variety of Olympic-type sports for children and adults with intellectual disabilities, giving them continuing opportunities to develop physical fitness, demonstrate courage, experience joy, and participate in a sharing of gifts, skills and friendship with their families, other Special Olympics athletes and the community. All training and competition opportunities are provided free of charge to the athletes and their families, enabling everyone to experience the benefits of Special Olympics that extend well beyond the playing field. Special Olympics was created by the Joseph P. Kennedy, Jr. Foundation. Special Olympics Rhode Island is authorized and accredited by Special Olympics, Inc. for the benefit of persons with intellectual disabilities. Special Olympics envisions a world where people with intellectual disabilities lead healthy, vibrant lives grounded in ongoing sports and physical activities, sound nutrition and a deeply held commitment to improve, compete, achieve and demonstrate their personal bests to themselves and their communities. Special Olympics envisions a world where people with intellectual disabilities and their families, know the best ways to optimize their health and well-being. We want to make sure that accessible information, resources, systems and policies exist at the individual at the individual, community, national and global levels that support them in realizing healthy and productive. At the first Special Olympics International Summer Games in 1968, Eunice Kennedy Shriver got down on the field during warm-ups. Shriver, the founder of Special Olympics, also loved being a coach. A few minutes after this picture was taken, she put on her bathing suit — and helped athletes and coaches at the aquatics events. From a backyard summer camp for people with intellectual disabilities to a global movement, Special Olympics has been changing lives and attitudes for 48 years. In 1968, Mrs. Shriver organized the first International Special Olympics Games at Soldiers Field in Chicago, in the belief that the lessons these athletes learned through sports would translate into new competence and success in school, in the workplace and in the community. Above all, Mrs. Shriver wanted the families and neighbors of people with intellectual disabilities to see what these individuals could accomplish, to take pride in their efforts and to rejoice in their victories. Today, Special Olympics Inc. is the world’s largest provider of fitness training, education and athletic competition — coupled with social, life and leadership skill development opportunities — for children and adults with intellectual disabilities. Special Olympics Rhode Island, an accredited program of Special Olympics Inc., was founded in 1972 and is the largest sports program in Rhode Island for individuals with intellectual disabilities. Special Olympics is a worldwide movement of more than 4.7 million athletes in 169 countries, where one can act locally, but make a global impact. With competitions around the world, daily training sessions and family leaders, athlete leaders and volunteers extending our message every day, Special Olympics is no longer just an event. We are a movement, inviting the world not only to attend Games but to think, feel and act differently about everything. Join us, you will be helping to create a world of acceptance and inclusion for all! Special Olympics Rhode Island is a year round sports training and competition non-profit organization with 501(c)3 status.